1978 Mustang - history,specs,performance and parts. 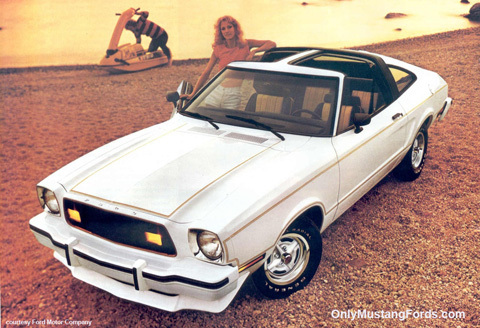 Although the 1978 Mustang itself, was not a turning point in the history of the car, it was a turning point in Ford's attitude towards Mustang development and its vision of the future. One that didn't (thankfully) include Lee Iacocca. 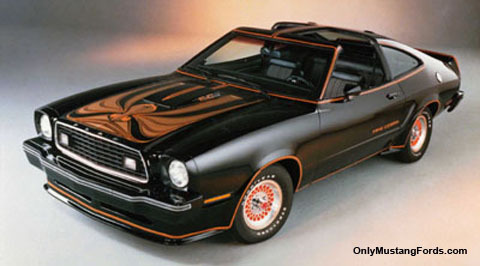 Some Mustang enthusiasts know, that Iacocca's vision for the 1978 Ford Mustang and the entire Mustang II concept was at best, not well liked by many of the engineers, responsible for its design and execution. Many thought it was a sellout to the proud heritage of the 60's and early 70's cars and I'll bet that a cheer rang out in the Ford Mustang design ranks,with word that Henry Ford II had fired Iacocca. 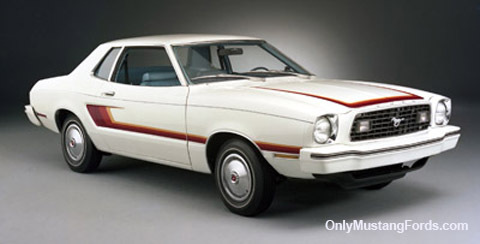 Ford filled the 1978 model year stables with several versions of the pony car. Returning were the two basic configurations, a 2 door hardtop coupe and a 3 door 2+2 hatchback/fastback. Special models included the return of the sporty upscale Ghia, which was essentially a new spin on the previous Grande models and the Mach 1, remembering the heydays of the 1960's and early 1970's,for those craving more excitement. The 1978 Mustang Cobra returned virtually unchanged, but a new "King Cobra" made it's first appearance in the Ford Mustang corral, sporting a bold Cobra snake mural on it's hood, similar to the Firebird Trans-Am "screaming chicken" graphic. Two features which make these pony cars instantly recognizable are it's special front and rear air dams (spoilers) and over-sized pin striping. These cars featured a new hod scoop which reversed the inlet side, facing it towards the windshield and as a throwback to the 1969 and 1970 fastback cars, some cool looking black louvers on the rear window. It was also the first Mustang to bear the now familiar 5.0 emblem. Giving the "Snake" some bite, the 5.0 liter (302 cubic inch) V8, available in the 1978 King Cobra, received a 4 speed manual transmission and an upgraded beefier suspension in it's Rallye Package. Although no major styling changes were made overall for the 78 Mustang, two options were there for enthusiasts who longed for the return of the Mustang convertible. A moon roof, allowed light and some air into the cockpit and for those who wanted the whole air-in-your-hair experience, lift off roof panels, called "T-Tops" became an available option. Available too, was a Rallye package that added heavy duty springs,special adjustable shock absorbers and a heavier duty cooling system. The car continued to be offered as a notch back or coupe, hatchback, upscale Ghia, and was heavily promoted in T Roof form for those customers still missing the convertible. A total of were 14 exterior combinations were available. 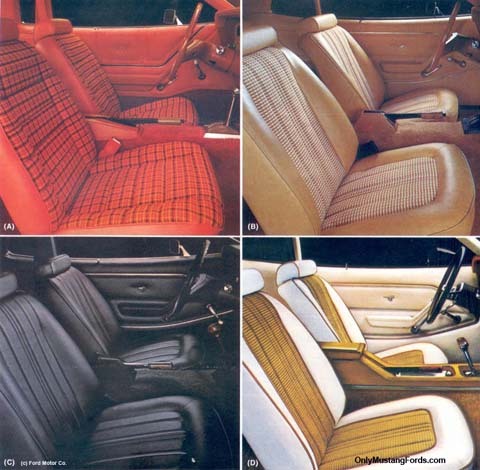 Interior styling remained virtually unchanged, with 7 different interior styles to choose from. While the Ghia's deluxe interior remained unchanged, the 2+2 models featured a new brushed look instrument panel. The engine choices remained the same for the 1978 Mustang. Although the King Cobra was heavily advertised as the performance king, it still was available with all of the engine choices, which were, the 2.3 liter inline 4 cylinder, the 2.8 liter V6 and the 5.0 Liter (302 cubic inch ) V8. Here's a Mustang ll that you've probably never seen, save for in an old Hot Rod magazine. It's called the Munroe Mustang Handler. The car was first seen as a project car featured on the June 1977 cover of HOT ROD Magazine. You may recognize the name of the engine builder, a Mr. "cactus" Jack Roush. Yep. The same Roush as you'll see on some very impressive new Mustangs. Here's some more information on the Monroe Mustang handler.